Really wonderful and charming 105 m2 log house from 1972 (partly renovated in 2006). It lies on a 1758 m2 natural plot, from which a path runs directly down to a lovely sandbeach. A large partly open partly roofed wooden terrace perfect for many hours’ relaxation. The house lies in a short distance from Nykoebing Sjaelland and Roervig Harbour, where there are lots of shopping possibilities. Holiday home suitable for 8 persons . 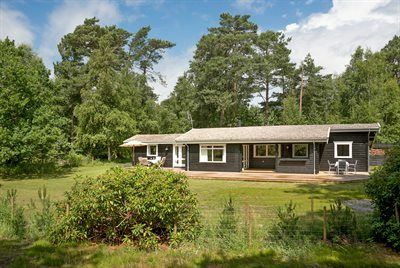 The holiday home is 105 m² and is build in 1972. In 2006 the holiday home was partial renovated. No pets allowed.The holiday home is equipped with 1 energy-saving heat pump. The holiday home has washing machine. Freezer with a capacity of 20 litres. Further more there is 1 wood-burning stove. For the youngest ones there is 1 high chair. The holiday home is situated on a 1758 m² natural site. Situated 600 m from the sea. Nearest shop is 800 m away. A 100 m² terrace belong to the holiday home. Furthermore the house has a 10 m² covered terrace. You find a tool shed. Sandbox. Barbecue at your disposal. Parking place by the holiday home.